Time has passed since the principle of fundamental dishonesty was introduced. Case law continues to evolve. There has been a visible shift towards punishing Claimants who exaggerate or falsify aspects of their personal injury claim. What are the consequences of lying about a personal injury claim? The consequences of lying about injuries or losses are undoubtedly detrimental to any Claimant who decides to pursue the path of deceit for financial gain. The purpose of a personal injury claim is to restore the Claimant’s position to their pre-accident position. A personal injury claim must not be used to make money for injuries and losses that are not genuine. 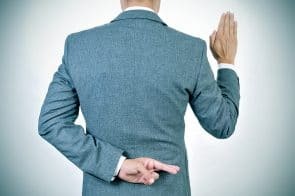 Fundamental dishonesty does not need to be expressly alleged by the Defendant in writing and the allegation can be advanced at any stage of a case. Some people who are pursuing a personal injury claim may fail to appreciate that a Court can order costs orders against them for making a dishonest claim. What may seem like a trivial attempt to exaggerate losses and/or injuries can have a spellbinding effect in relation to the outcome of a case. A woman was given a suspended sentence for faking an injury claim where she claimed to trip over a pothole and sustain an ankle injury. In reality it transpired that she sustained the injury trying to catch her neighbour’s dog whilst drunk. Her claim for damages was dismissed at court. The Council then brought separate proceedings for contempt of court. The Claimant was sentenced to three months imprisonment suspended for two years. In a separate case a gentleman who was involved in a Road Traffic Accident claimed it took him ten months to recover from his shoulder injury. He claimed the muscles in his shoulder were crushed and his vehicle was hit with a heavy and violent impact. He had in fact recovered after having physiotherapy treatment five weeks after the accident. Upon appeal the Judge found him to be fundamentally dishonest. In another case, a cyclist claimed he could no longer cycle after he had an accident caused by an exposed manhole and sustained an elbow injury. He claimed a six figure sum however social medical evidence revealed that he had fallen off his bike trying to mount a kerb. He was order to pay the Council’s wasted costs incurred to defend this bogus claim. A grandmother claimed she could not move her right arm after an accident and claimed damages for £100,000. She claimed to need constant help from family members with household chores however a video showed her taking part in the charity ice bucket challenge without any problems. The Defendant arranged surveillance which revealed she could lift a pushchair onto a train and carry her grandchild. As a result she was ordered to pay legal costs for the Defendant. Holiday sickness claims have been plagued with dishonest claims being made by holidaymakers who claim to have suffered gastrointestinal symptoms due to alleged poor hygiene during their holiday. A holidaymaker in Cape Verde claimed their meals were not properly prepared. Their Facebook posts revealed the Claimant to be completely well during their stay. The Court ordered him to pay the Defendant’s costs in the sum of £19,025. As personal injury solicitors it is something which we make sure we inform our clients about. Our job is to right a wrong and not have people profit from it. Insurance companies are keen to pursue recovery of their losses due to such claims and set an example of those claimants’ who are opportunistic. The above case studies serve as a stern reminder for people not to be tempted to fabricate the circumstances of their accident, injuries and financial losses or else face severe penalties in the form of a wasted costs order and/or a custodial sentence. The risk is simply not worthwhile!